Besides, I’ll probably take another shorter hike Monday when Gary is available. I usually take my birthday off from work, but it fell on a Sunday this year, so I plan to take the Monday instead. The birthday wanderlust tradition began on my 50th birthday, in imitation of Bilbo Baggins, who went on an unexpected adventure at that age. Admittedly, that’s about the equivalent of 30 for a human (hobbits live longer than us) but still. I chose as my adventure the relatively new network of trails into Forest Service land in the Chili and Medanales quadrangles. 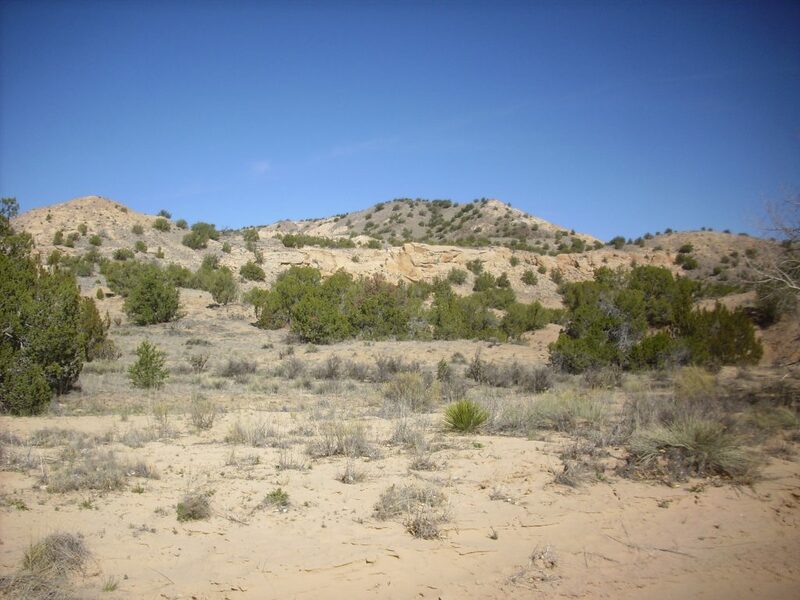 These are north of the Santa Clara Mountains and between Lobato Mesa and the main highway to Abiquiu, an area of badlands that has never had any significant settlements but features some Lobato Mesa Formation dikes and other geologic wonders. The trailhead is just off the highway. Here I park, slather on polyphenols as a charm against skin cancer, put on a hat for extra protection, put on my hiking boots, grab my pack and walking stick, stuff cell phone, GPS, and old camera in my pockets, carefully lock my car, and head out. I’m on my way by about 10:00 in the morning on what is, for the moment, a very pleasant day. 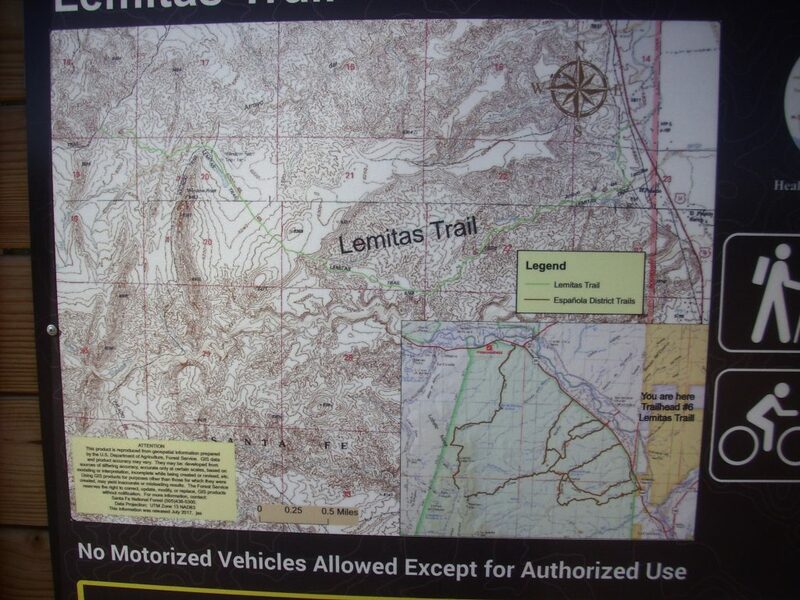 This is the Lemitas Trail, named for Arroyo de las Lemitas. Lemitas is apparently the name of a somewhat sour wild berry, akin to skunk berries. 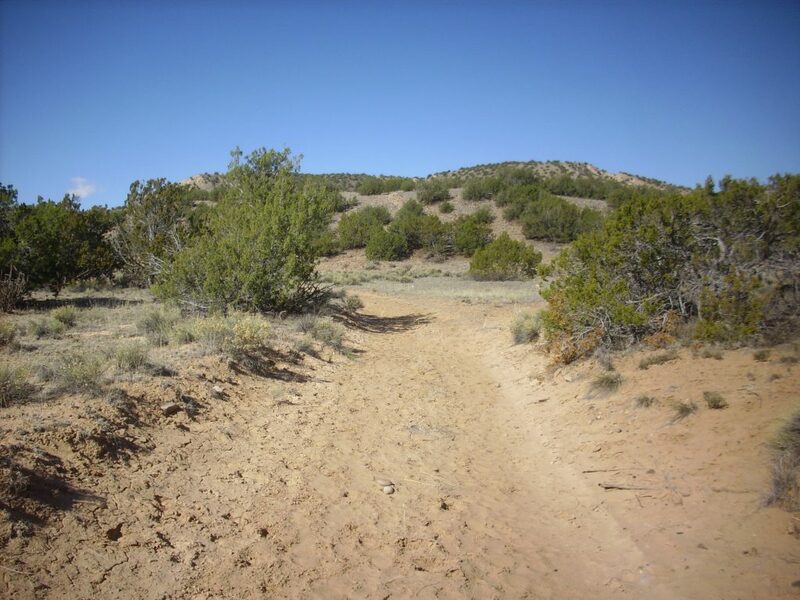 The trail will take me south to the arroyo, then west to the igneous dikes that are a major geologic feature of this area. 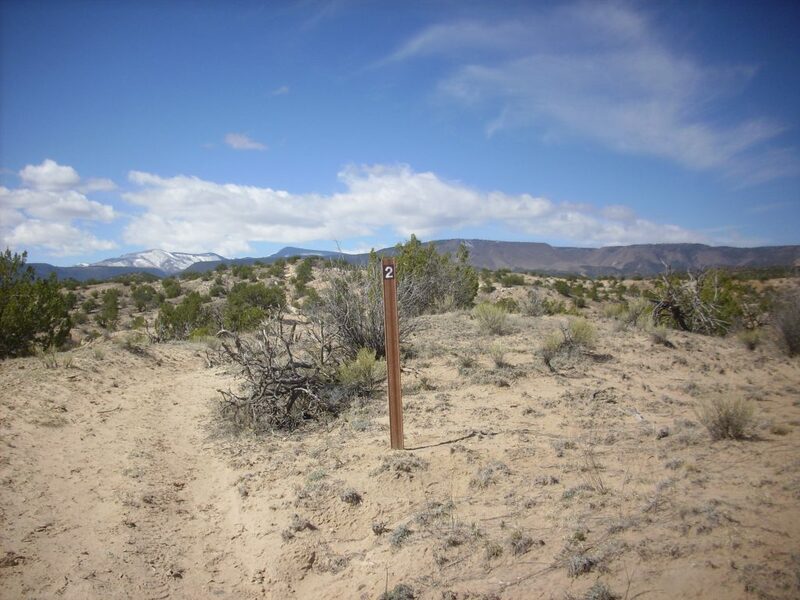 The trail is marked for hikers, bikers, and horses, but no ATVs are permitted. Judging from obvious traces along most of the trail, some folks consider the latter to be just a suggestion. 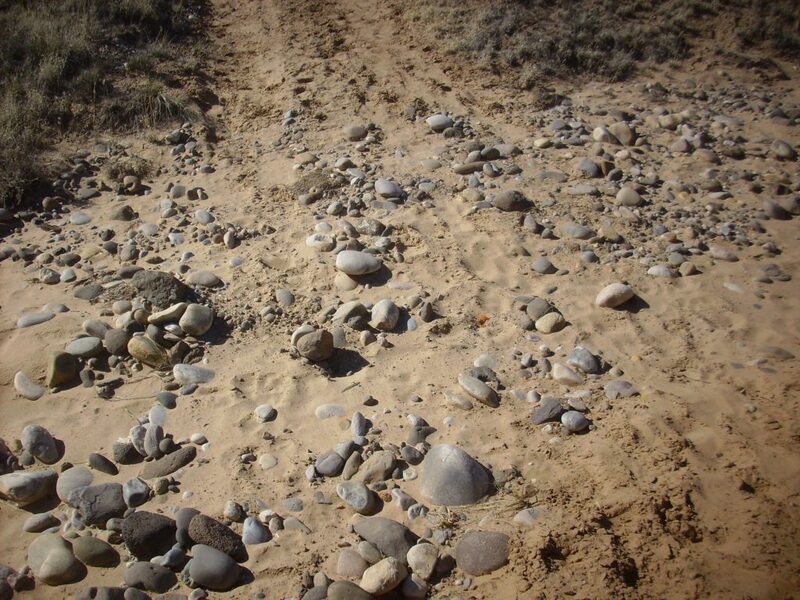 Much of the first part of the trail, especially where it follows the arroyo, is rather soft sand that is not entirely pleasant hiking. 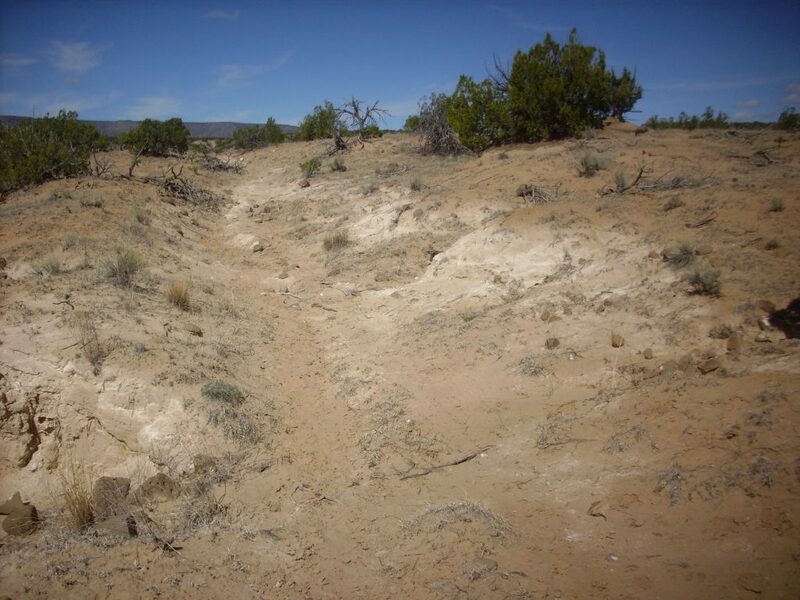 Here the trail crosses a small unnamed arroyo. 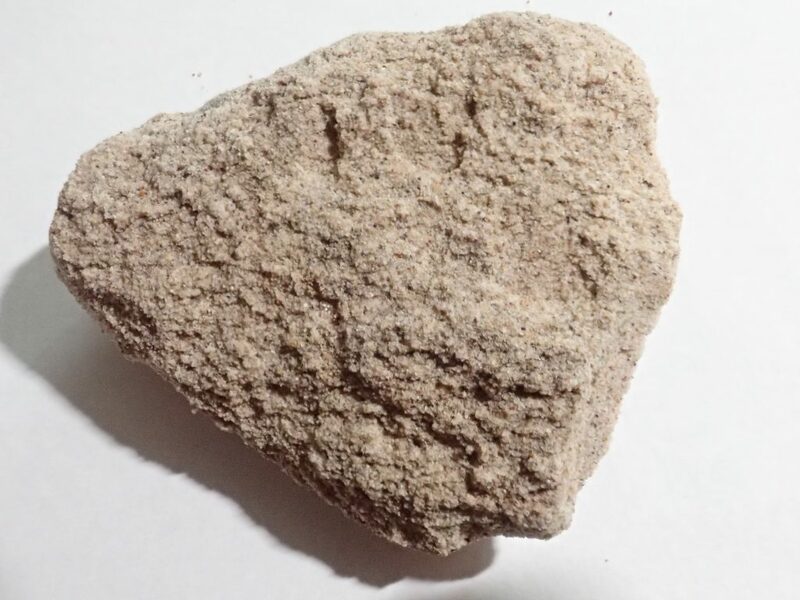 The clasts (geologist-speak for “chunks of rock”, whether ten feet or ten microns across) are mostly quartzite, with just a scattering of volcanic rocks. That means this is mostly stuff washed down by the ancestral Rio Chama from the Tusas Mountains to the north. 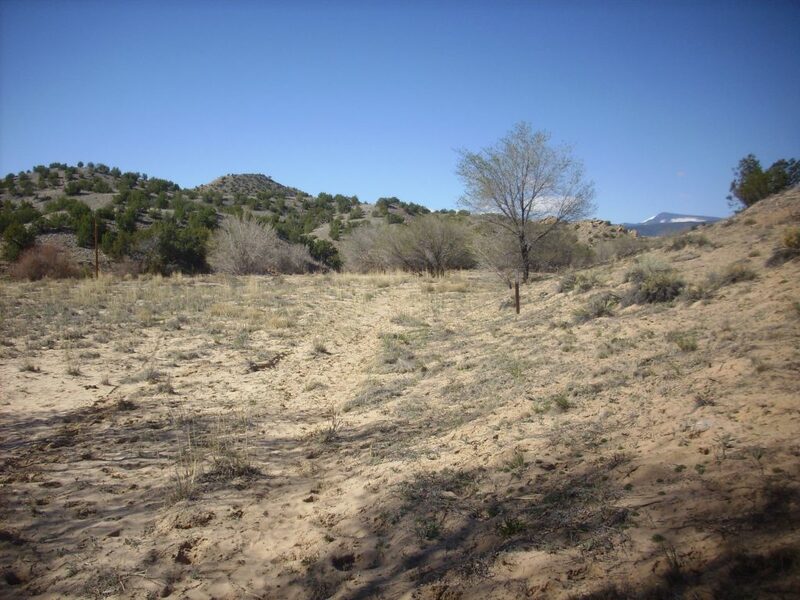 Both the Rio Grande and the Rio Chama formerly had their course further west, but were pushed east by the growing volcanic pile of the Jemez Mountains. This looks like a borrow pit. On closer examination, I don’t think so. 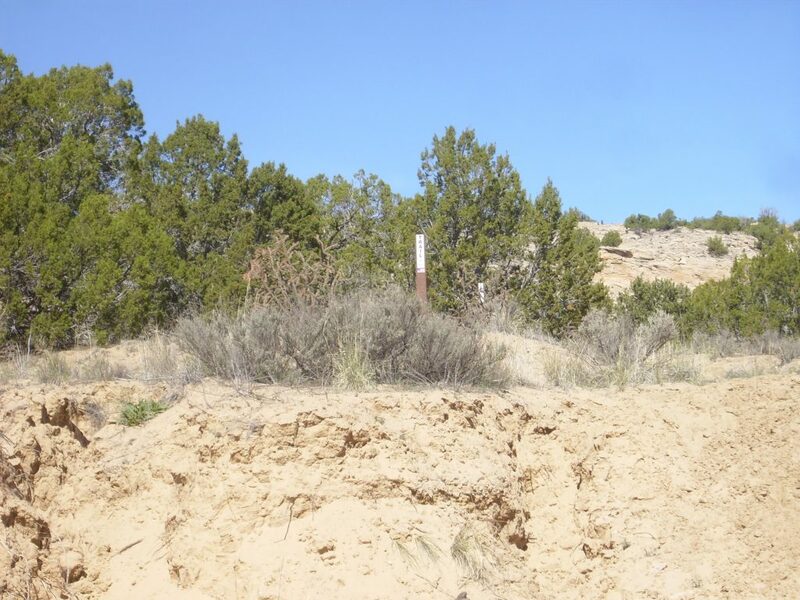 A borrow pit is where local gravel or sand is dug up for road construction or other civil engineering. This gravel is somewhat fine, rather well-sorted (meaning, has clasts all the same size) and looks like nothing else I see along this trail. So this is probably an old gravel dump, where gravel was brought in and stored until needed. 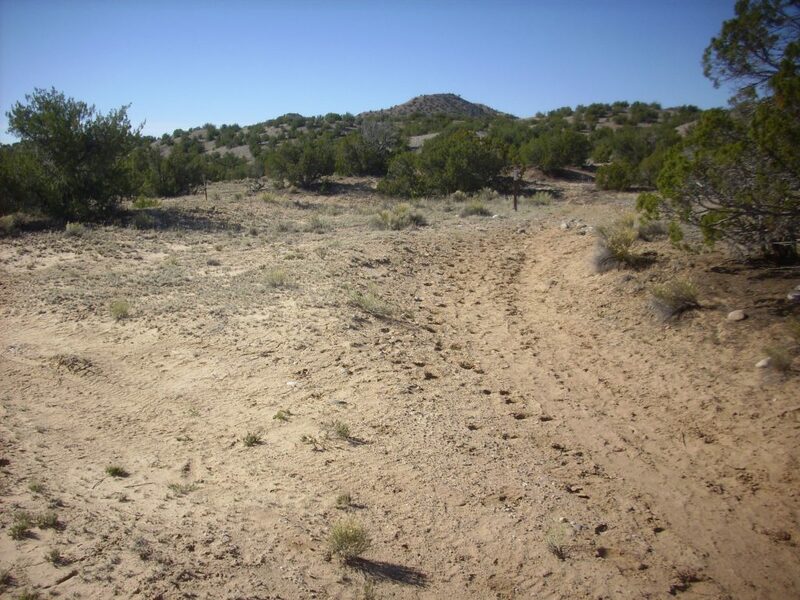 I find that the trail has a combination of hoof prints, footprints, and ATV treads along most of its length, which aids navigation. There are also prints of what looks like a small dog, not necessarily domestic. Approaching Arroyo de las Lemitas. This is where the trail begins to be uncomfortably sandy for a long stretch. 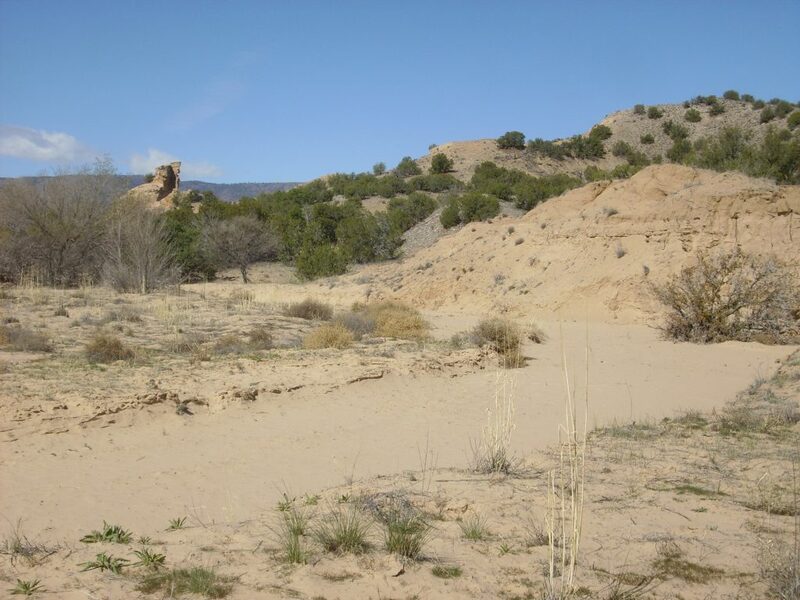 The sand is probably derived from the Ojo Caliente Member of the Tesuque Formation, though which almost all my hike will take place. 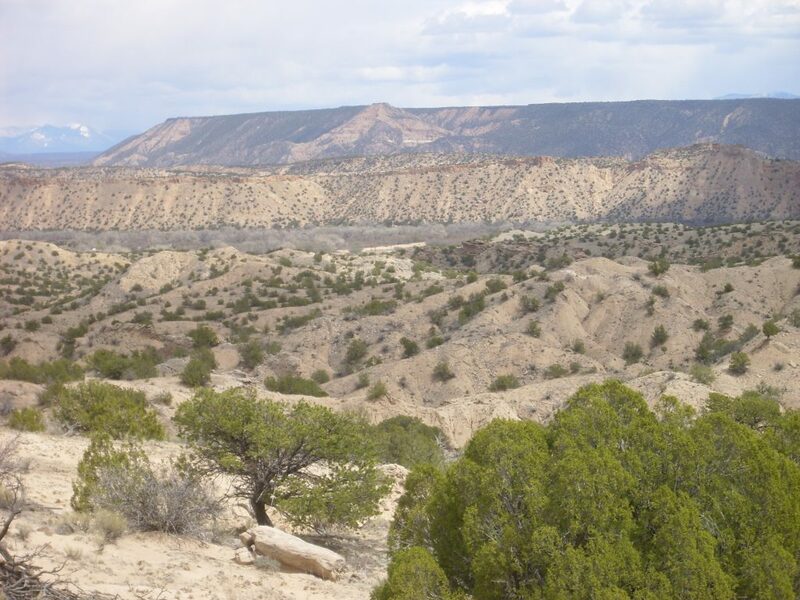 Thirty million years ago, the Colorado Plateau began to separate from the rest of North America, forming a great crack in the Earth’s crust called the Rio Grande Rift. The modern Rio Grande Valley roughly coincides with the Rift. As the Rift opened, it immediately began to fill with sediments from the high ground to east and west. These are the Santa Fe Group. 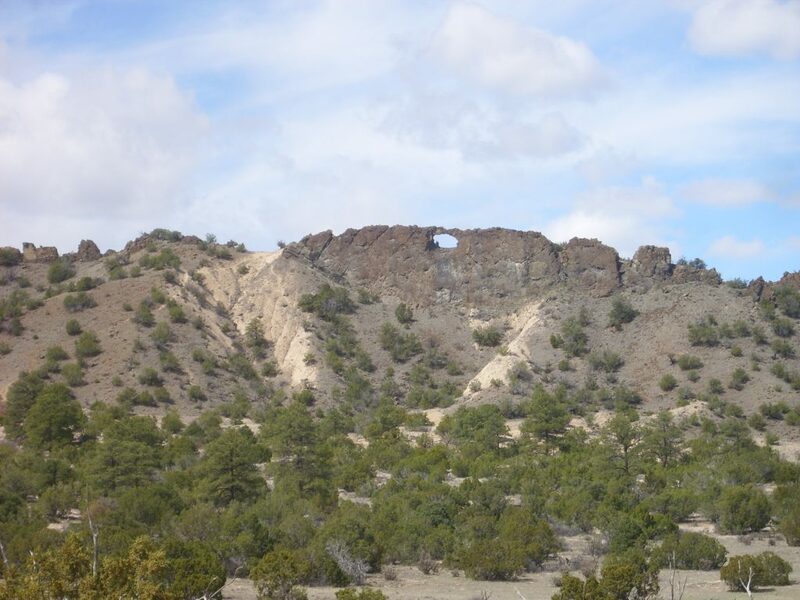 The most important local Santa Fe Group formation is the Tesuque Formation, named for its spectacular exposures near Tesuque Pueblo north of Santa Fe. 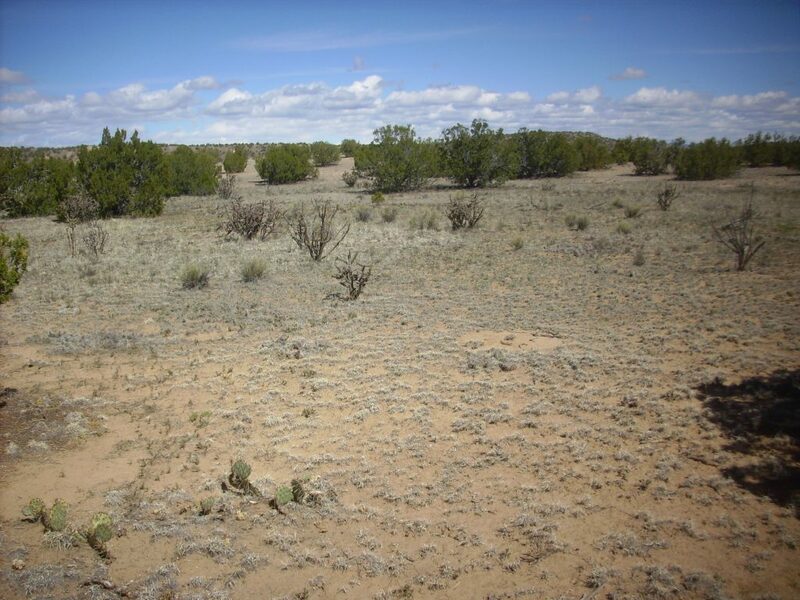 Between 10 and 14 million years ago, the area north of Espanola and (mostly) west of the modern Rio Grande was covered with windblown sand that formed a dune field. 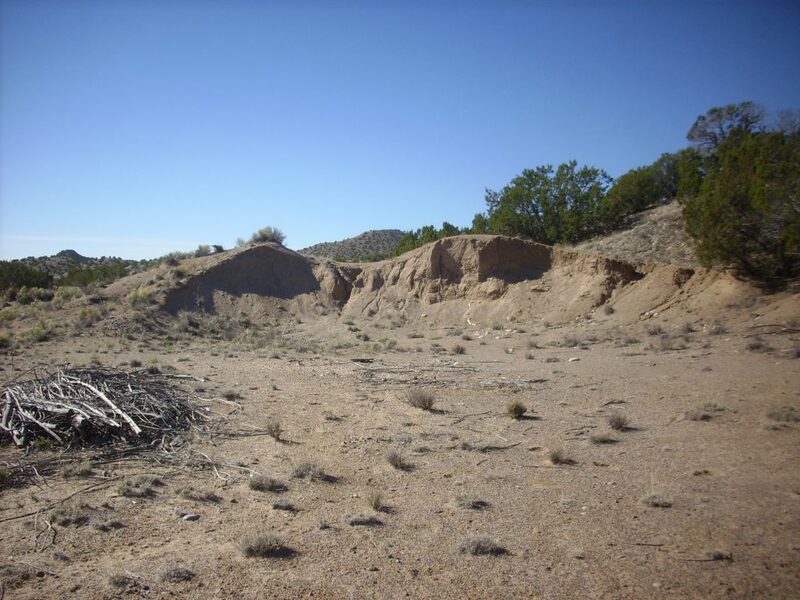 This became the Ojo Caliente Member of the Tesuque Formation, and, even today, much of it is very loosely consolidated dirty sand. The trail enters the arroyo itself. 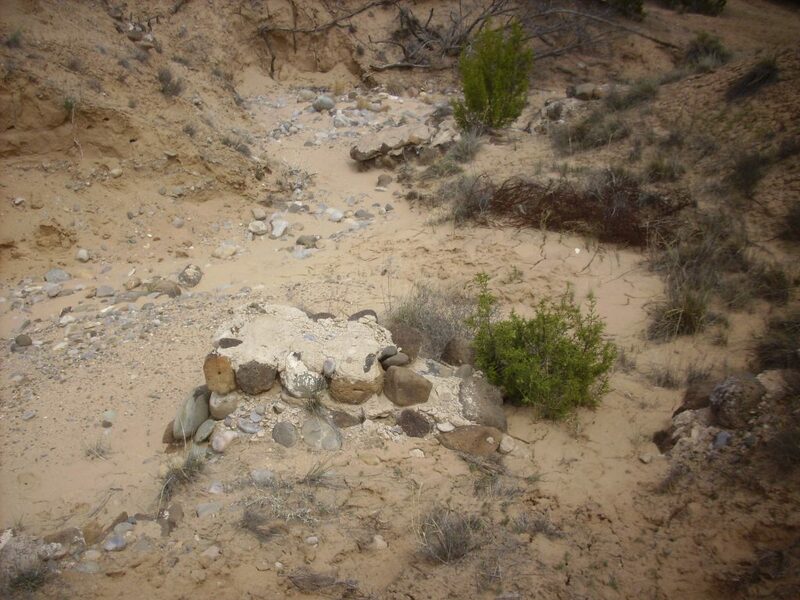 The trail follows the arroyo west, where I begin to see more solidly cemented beds of the Ojo Caliente Member in the arroyo walls. The lenses of gravel are probably stream channel gravel from minor tributaries to the ancestral Rio Chama. 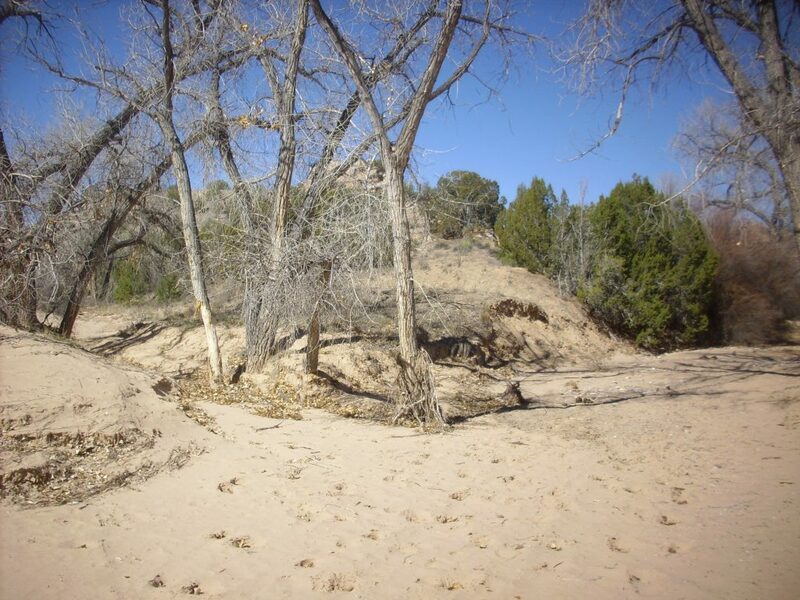 The silty beds are overbank deposits, formed during periodic flooding of the river valley. 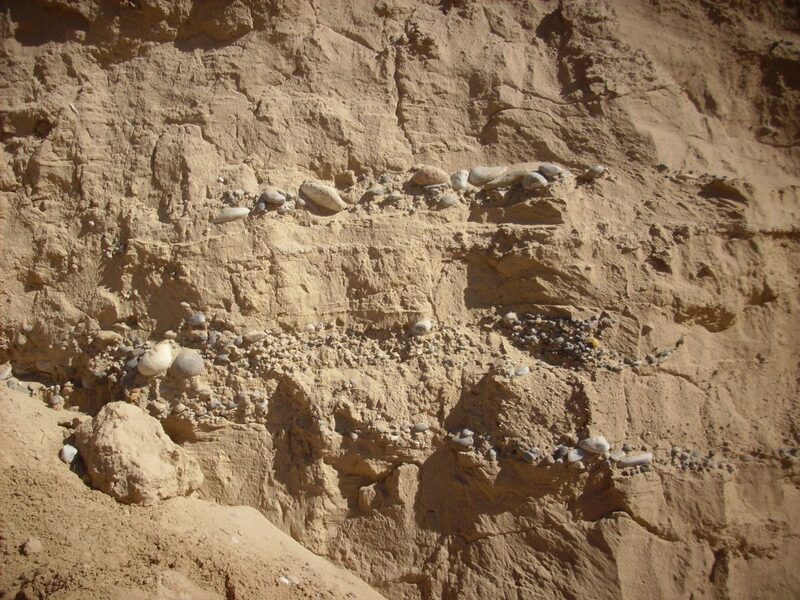 The clasts in the gravel are a mixture of quartzite and volcanic pebbles. 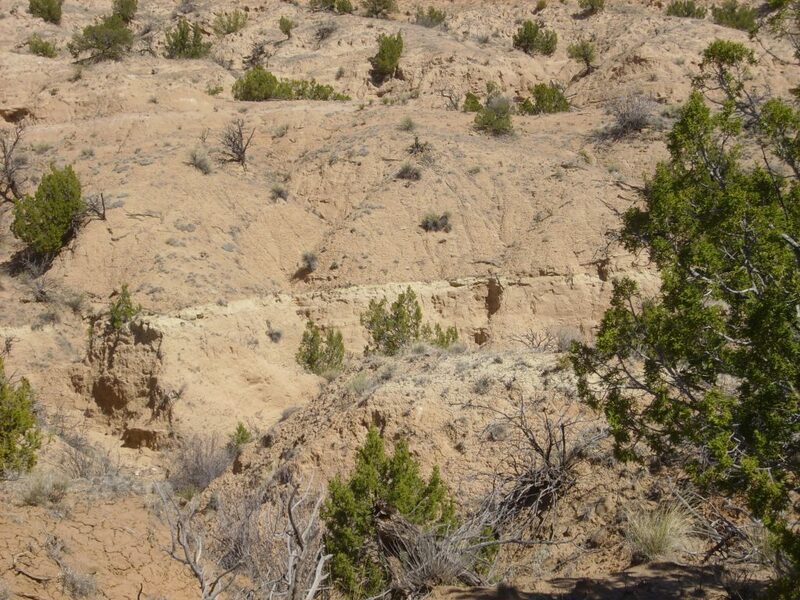 This suggests these beds are younger than Jemez volcanism, or less than about 15 million years old. A little further on, I come to a rock slide. 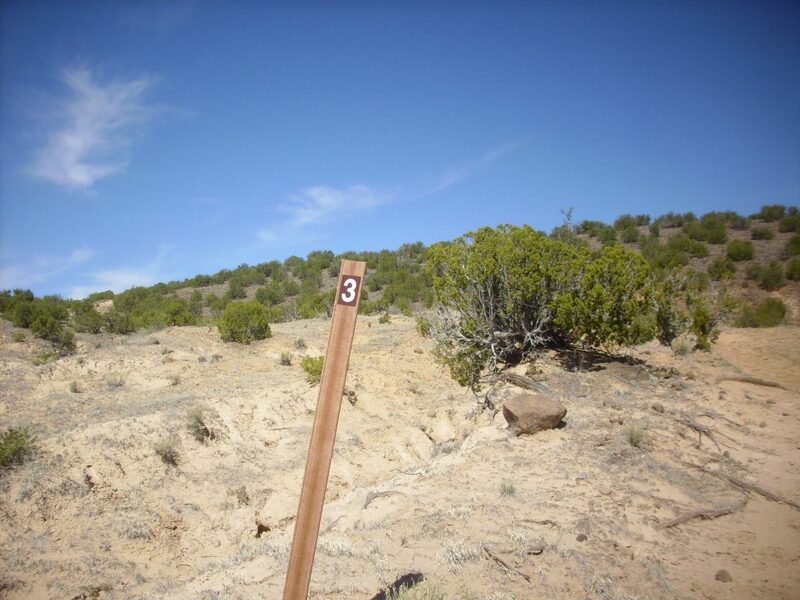 This is one of the few spots where we see any units other than the Ojo Caliente Member. 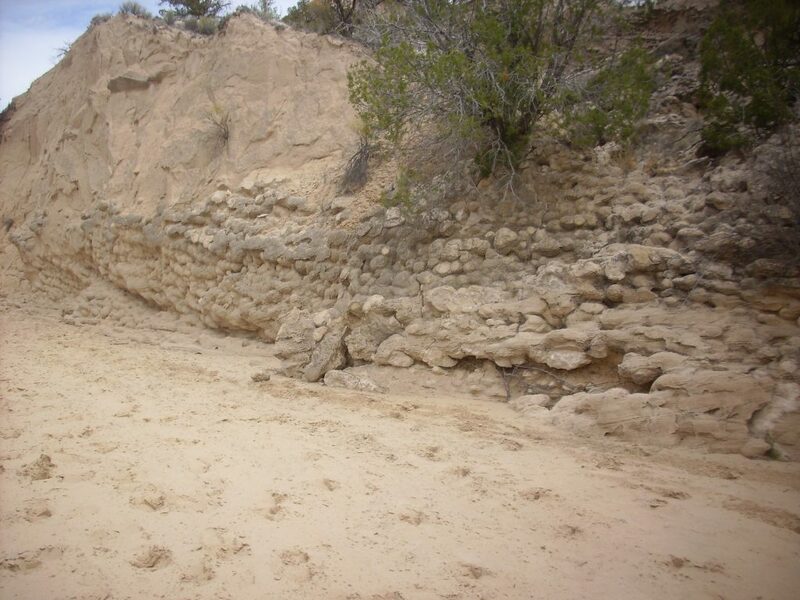 The lower part of the arroyo wall, composed of nearly level beds of silty sediments, is the Chama-El Rito Member of the Tesuque Formation. This member is 17 to 11 million years old, so it began to be laid down well before the Ojo Caliente Member, but thereafter overlaps it in age. It is river valley sediments derived mostly from the northwest. 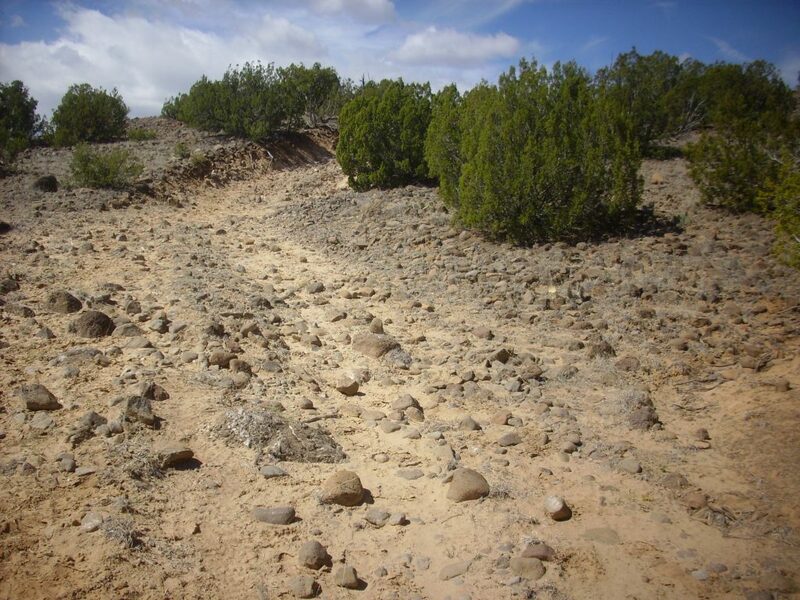 Above the Chama-El Rito Member is a thick gravel bed marking the transition to much younger gravels of the ancestral Rio Chama. This is the Qtc6 bed of Koning et al. from their 2004 map. The clasts are mostly quartzite but there are a fair number of volcanic bounders. 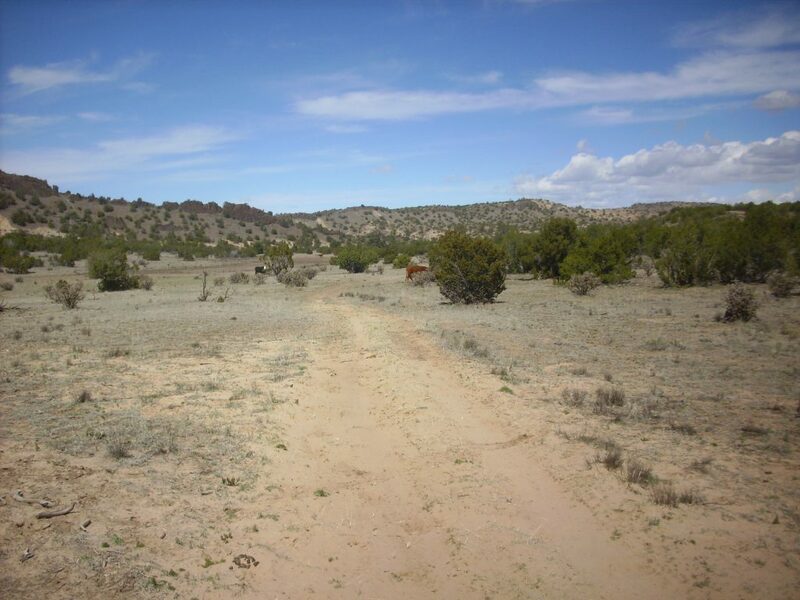 Just west of here, a fault thrown down to the west marks a shallow graben, or strip of ground thrown down by faults, where I will cross into the Ojo Caliente Member for almost the entire rest of my hike. Here I encounter another fork, with no helpful signage. The hoofprints go right, so I head that way. This turns out to be correct. The fork to the left seems to mark the trace of the aforementioned fault, so I am now crossing into the Ojo Caliente Member. Well-cemented beds come into view. 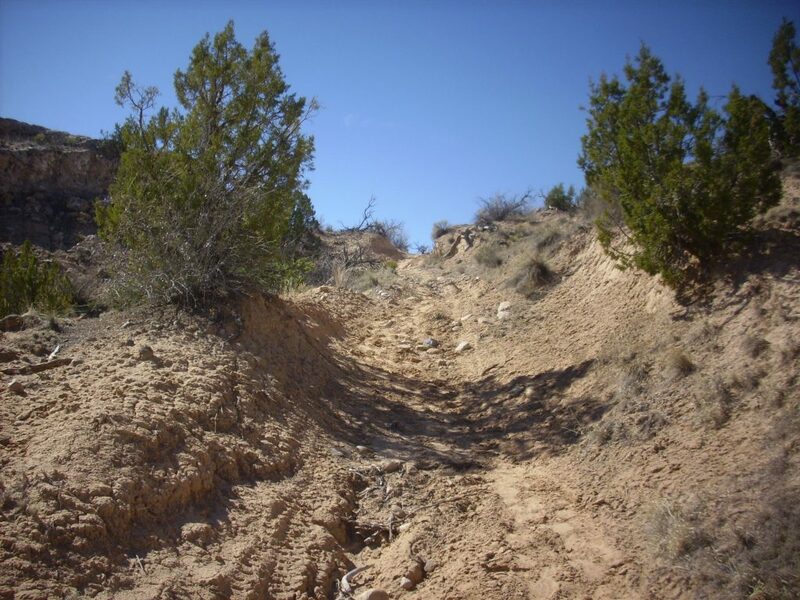 The Ojo Caliente Member along this trail is a hodgepodge of both soft and of well-cemented beds, mostly close to level, but with occasional odd features dipping steeply. I decide to stop at an outcrop for a sample, and to test my blood sugar. 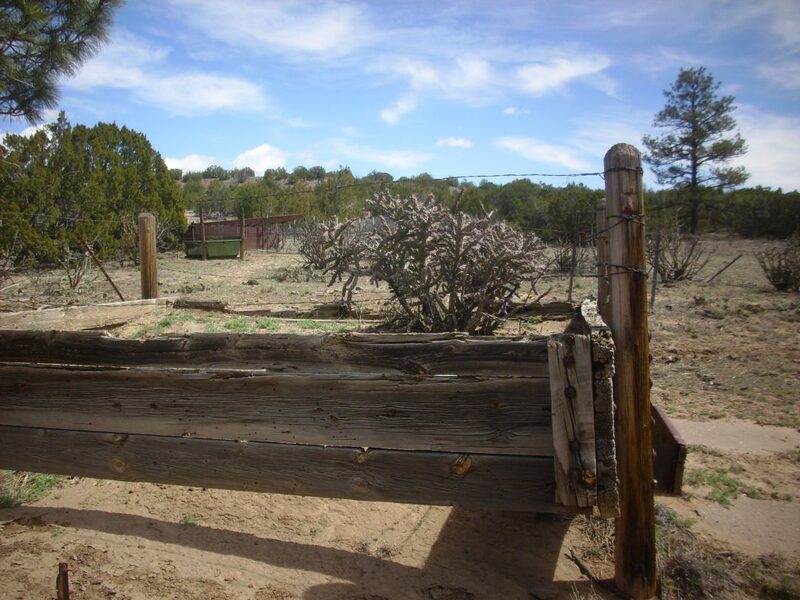 This is an example of the odd features sometimes found in the Ojo Caliente Member. In an area of generally flat, poorly-cemented beds, this is a nearly vertical, well-cemented feature. No fault is mapped anywhere near this area. Go figure. This bed apparently extends for some distance to the southwest. The geologic map does not call it out, so it’s still Ojo Caliente Member, but the “pillow” structure of the sediments is unlike anything I’ve seen in this area. It reminds me a little of of Goblin Valley State Park in Utah, near the San Rafael Swell. 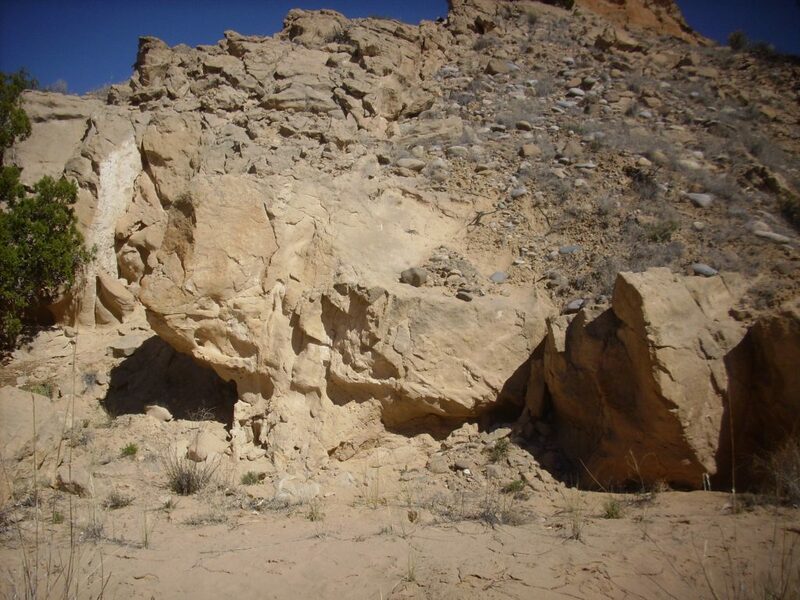 There the formation is the Entrada Formation, which at that location is also a muddy, immature sandstone. More vertical fins of well-cemented material. I will continue to see near-vertical fins like these, all striking nearly north-south, for the next mile or two of trail. I do not know what they are. My wild theory is that these actually were fins, like those at Arches National Monument in which arches form, eroded out of harder sandstone and then buried again by younger sediments. But that seems unlike. 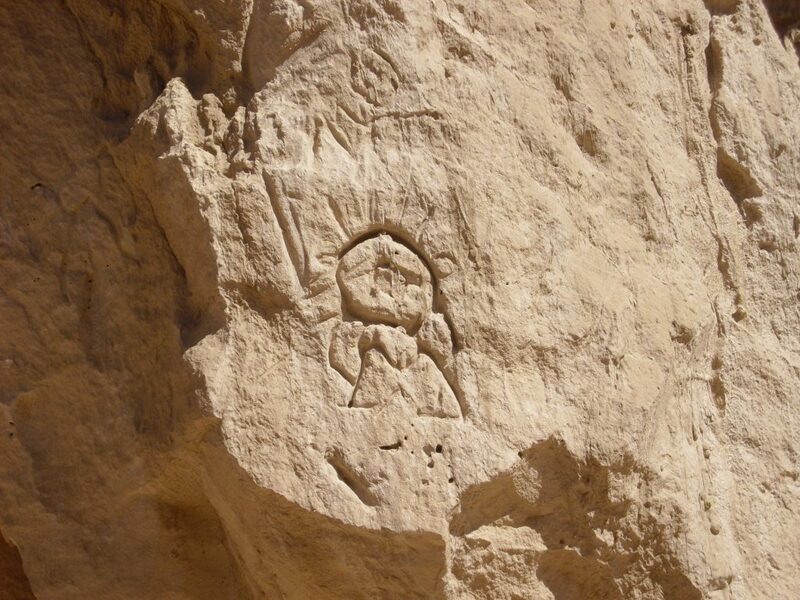 Petroglyph, probably historic, since the arroyo walls here erode quickly. Or possibly prehistoric and luckily preserved. The pattern strikes me as possibly a prehistoric one. 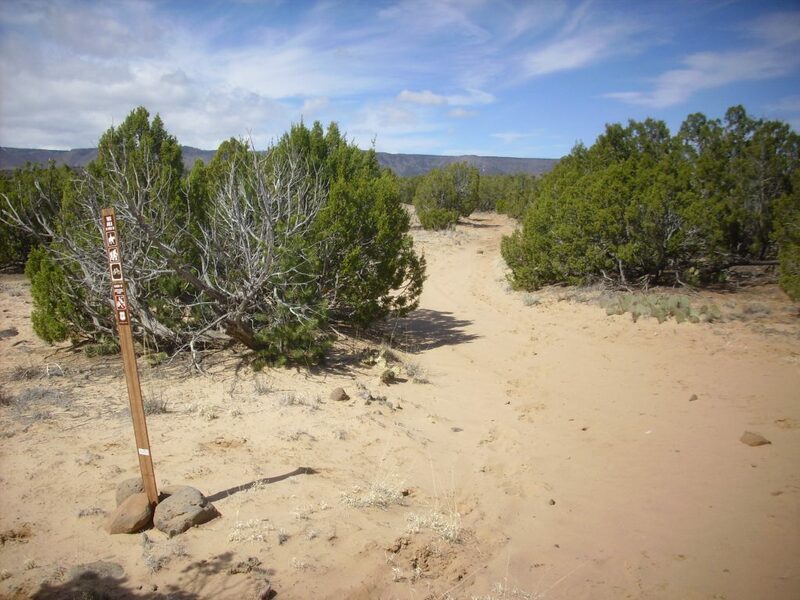 The trail finally leaves the arroyo bed, and fortunately the spot is very well marked. The trail climbs up to the ridge on the south. As I climb, I hear what sounds like gun shots to the south. There’s no prohibition on target shooting on Forest Service land, but as I listen further, I conclude that it sounds more like heavy machinery banging. Possibly from the diatomite mine in that direction? 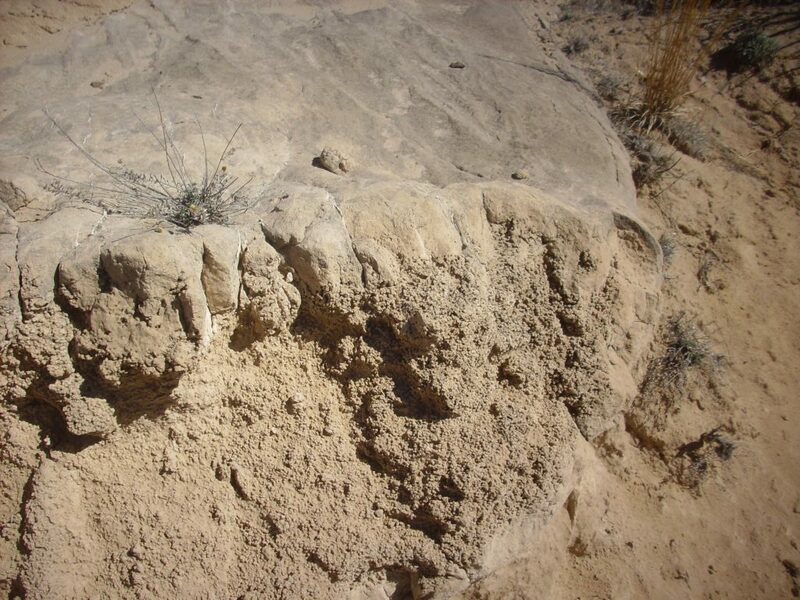 Near the top is a flat bed of well-cemented sandstone with concretions. This seems like a good spot for my first panorama of the day. 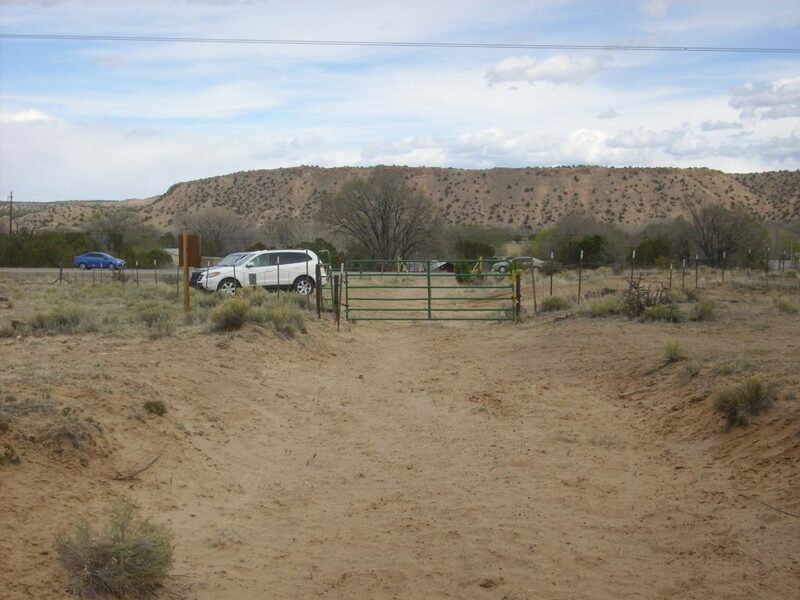 This shows the extensive exposures of the Ojo Caliente Member on the north side of Arroyo de las Lemitas. There is a bed across the trail suitable for a sample. The sample images, by the way, are taken with my brand-new camera, today’s birthday present. It was a lot of money but I’m grateful to Cindy for getting it for me anyway, in time for the big adventure in two weeks. I find it interesting that the pictures come pre-tagged as from the camera. I’ll probably remove that caption from now on. Earlier I had seen a cryptic “1” sign. Now it’s “2”. And I finally get a clue: I’m now 2 miles from the trail head. I check: it’s been almost exactly an hour. In fact, I’ll find that I’m hiking almost exactly two miles an hour this entire hike. In the background is the Tschicoma Highlands, still covered with snow, at left; and Lobato Mesa at right. And the weather is starting to deteriorate a little. 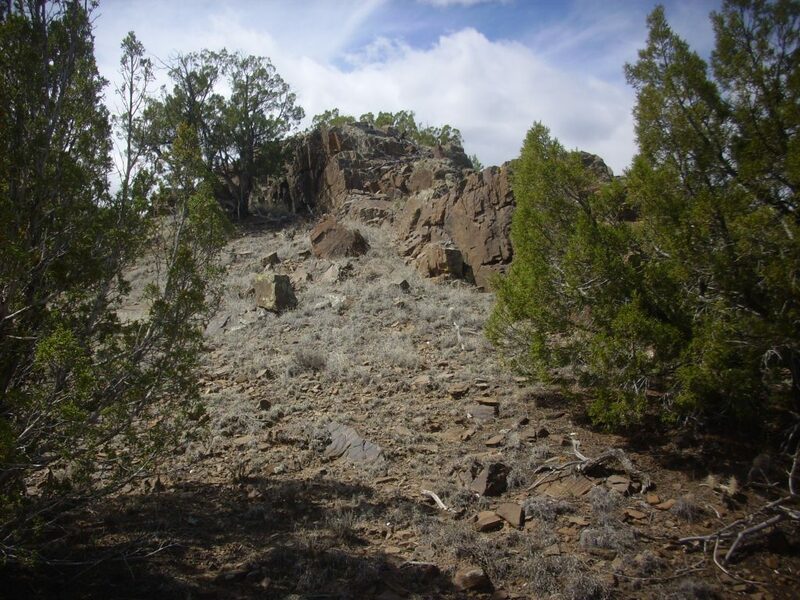 I come into view of a ridge to the north that is covered with dark basalt rubble. The geologic map has this as Qtc3, a river terrace level of the ancestral Rio Chama, capped with old alluvium and eolian sediments. Let’s unpack that. The western United States, including New Mexico, are being constantly uplifted on geologic time scales as North America drifts onto the East Pacific Rise, a great upwelling in the earth’s mantle. This means that rivers in our area are constantly cutting downward. But this does not take place steadily; rather, rivers tend to cut down to some obstruction (a knickpoint) that establishes a base level below which the river cannot cut right away. Upstream of the knickpoint, the river valley has time to erode nearly flat. When the knickpoint is finally eroded through, the base level abruptly drops, and the river abandons its old flood plain, cutting a new flood plain at the lower level. But remnants of the old flood plain remain as flat terraces above the current river level. 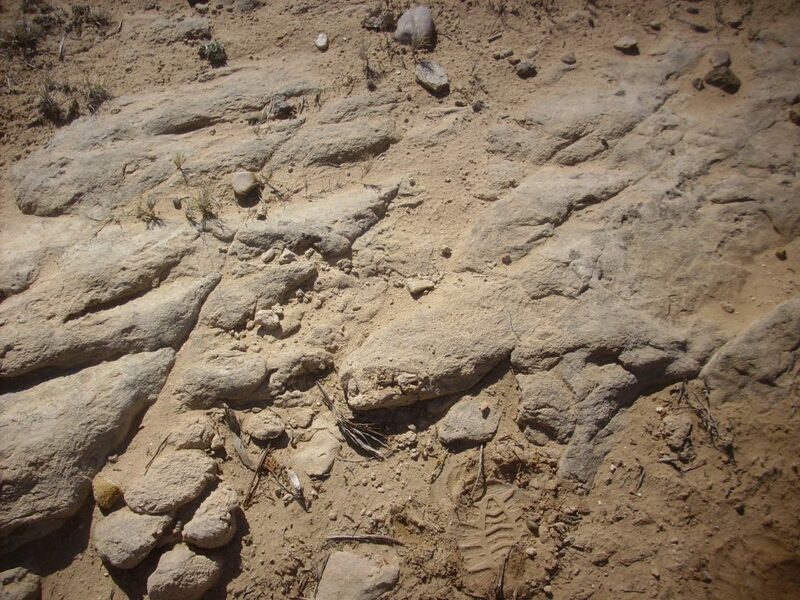 Because there has been so much uplift in the last few million years, geologists have identified seven distinct terrace levels near the Rio Chama. The terrace level we’re looking at in this photograph is capped with a layer of old alluvium or sediments carried by the river. These are mostly basalt cobbles of Lobato Mesa basalt. This gives a dark color to the mesa tops. 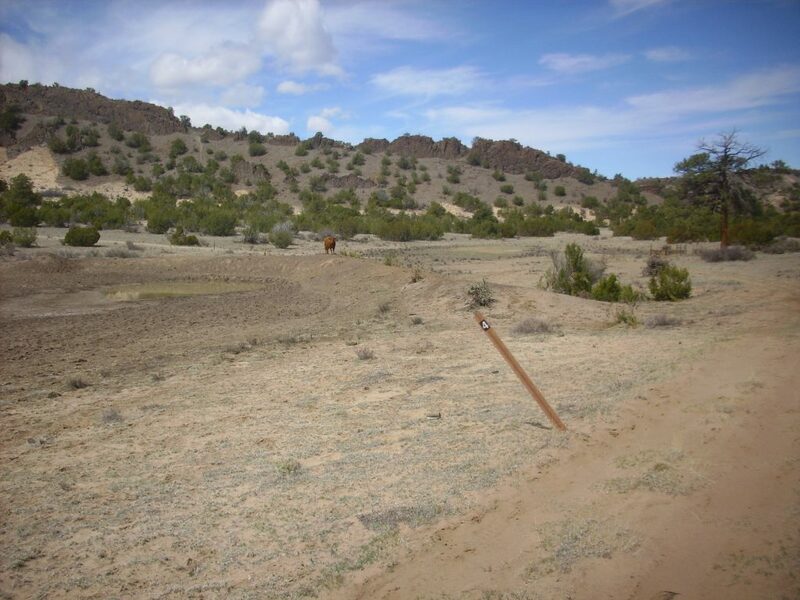 So, unlike the solid black basalt capping the Cerros del Rio near White Rock or Black Mesa north of Espanola, this is basalt that has already been eroded from a flow and redeposited on nearby flat ground. 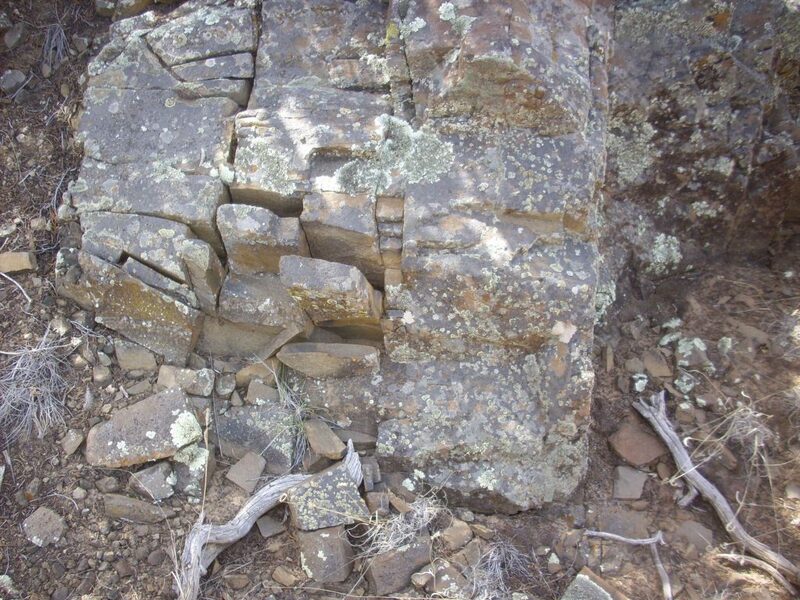 Atop the basalt is a layer of eolium, finer sediments transported by wind. I come to an area of relatively flat ground from which I have a good view to the west. At left on the skyline are the dark hills of the Santa Clara Mountains, with Cerro Roman at left and Clara Peak to its right. To the right of these and in the distance are the snow-covered Tschicoma highlands, with Tschicoma Peak itself almost centered on the panorama. In front of Tschicoma Peak and extending almost to the right edge of the panorama is Lobato Mesa, with La Sotella forming the high point right of center. Both the Santa Clara Mountains and Lobato Mesa are underlain by dark basalt of the Lobato Mesa Formation. This erupted mostly between 8 and 10 million years ago as low-silica lava from the earth’s uppermost mantle, which because of its low silica content was fluid enough to spread out as flat flows rather than volcanic cones. Repeated flows formed a shield volcano, with quite gentle slopes around the vents. 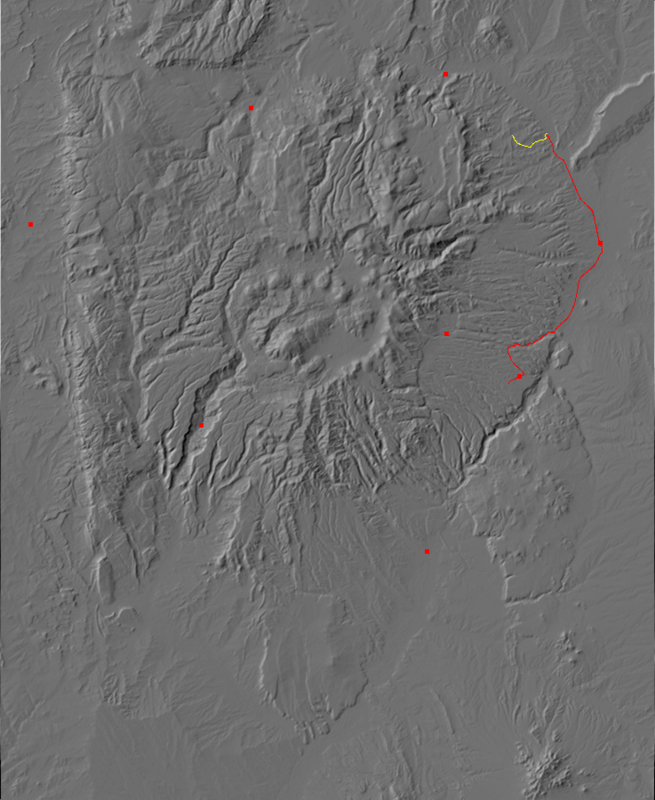 Clara Peak was likely one source area, and La Sotella another. 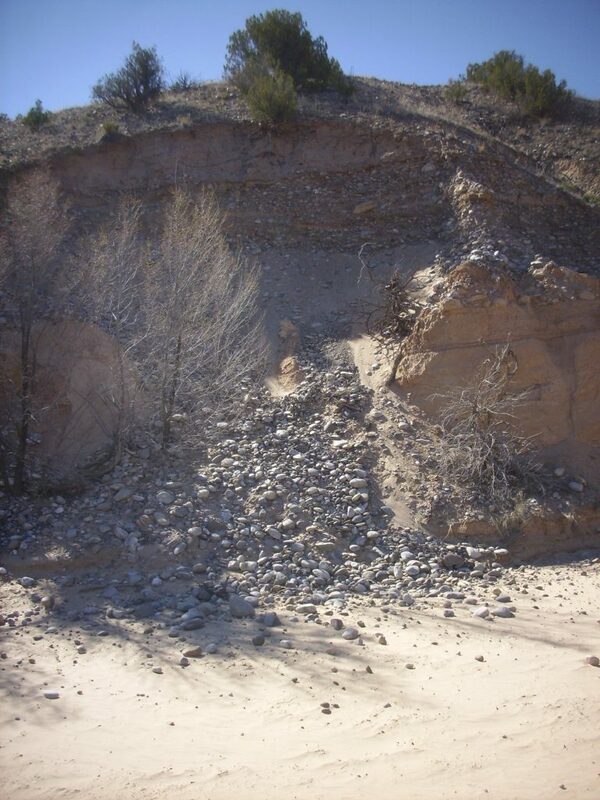 Subsequent erosion of the softer sediments of the Ojo Caliente Member around the flows left the flows as a high mesa, a common pattern in New Mexico. 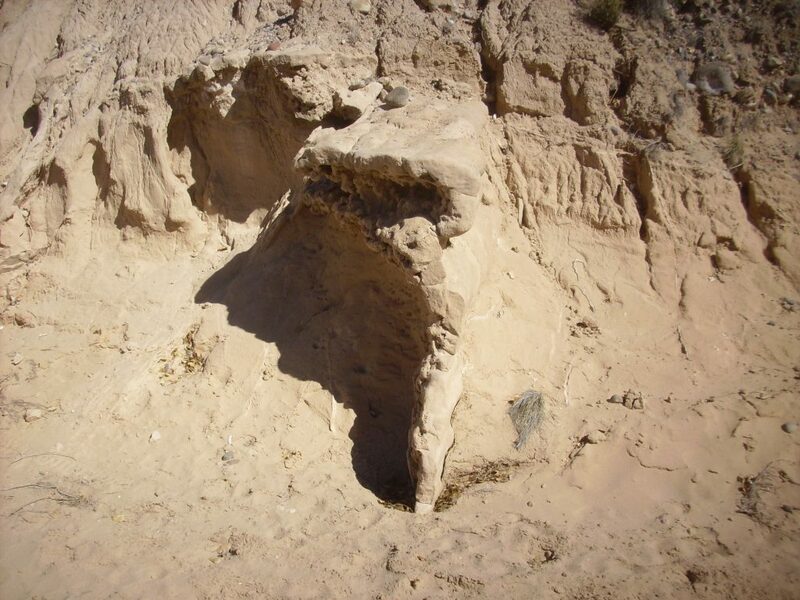 This is called inverted topography, since the flows likely followed low ground, and are now the high ground as a result of erosion. 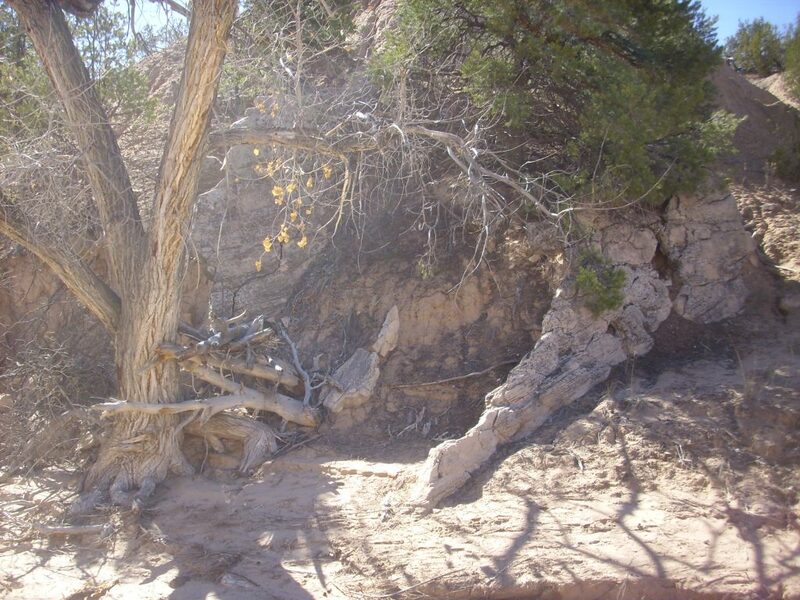 The erosion was deep enough along the foot of the mesa to erode the Ojo Caliente Member entirely and expose the Chama-El Rito Member beneath. 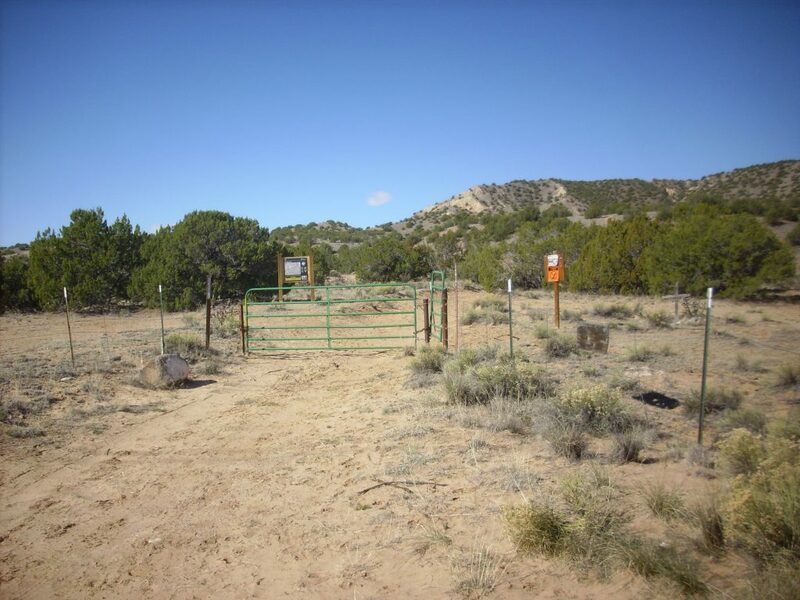 However, my hike today will not bring me close enough to the foot of Lobato Mesa to reach the Chama-El Rito Member. The Tschicoma Highlands are younger, having erupted around 3 million years ago as part of the Tschicoma Formation. 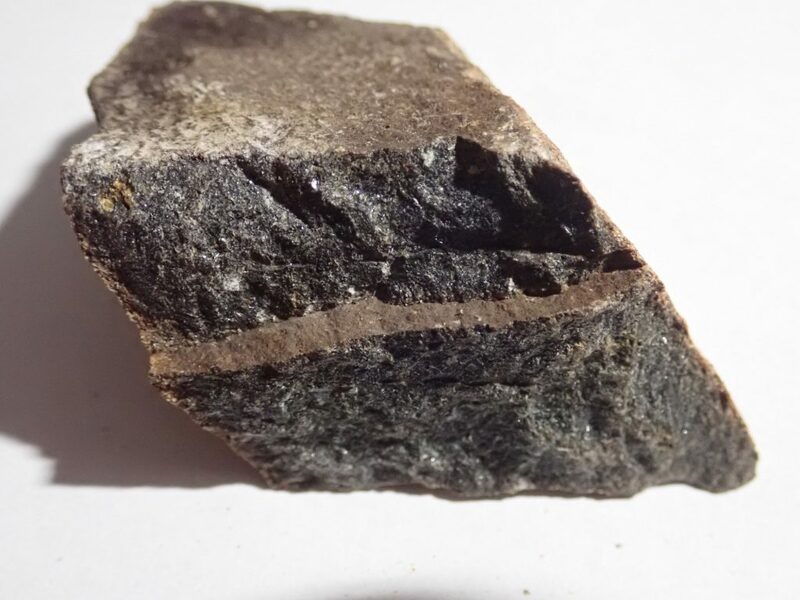 This is high-silica lava that formed a rock called dacite. 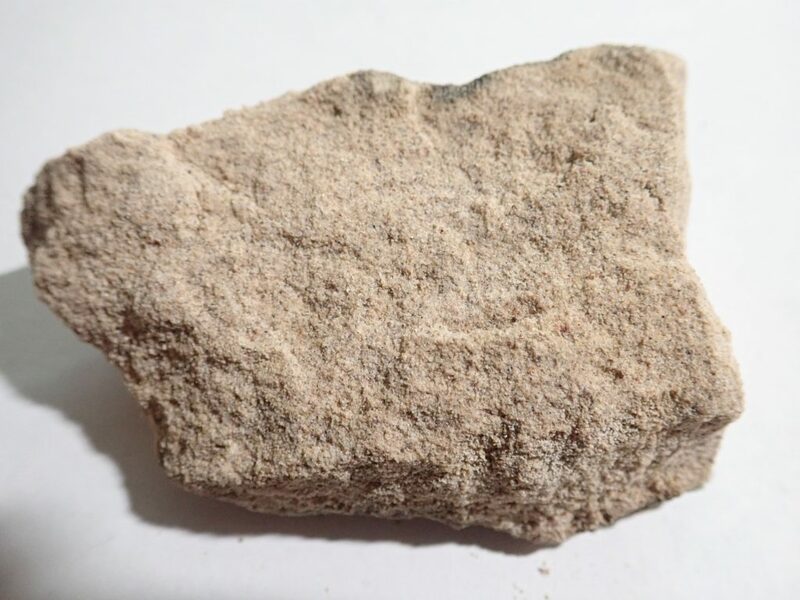 Because of its relatively high silica content, it is both lighter in color than the dark basalt of the Lobato Mesa Formation and was much more viscous, forming high mountains rather than flat flows. 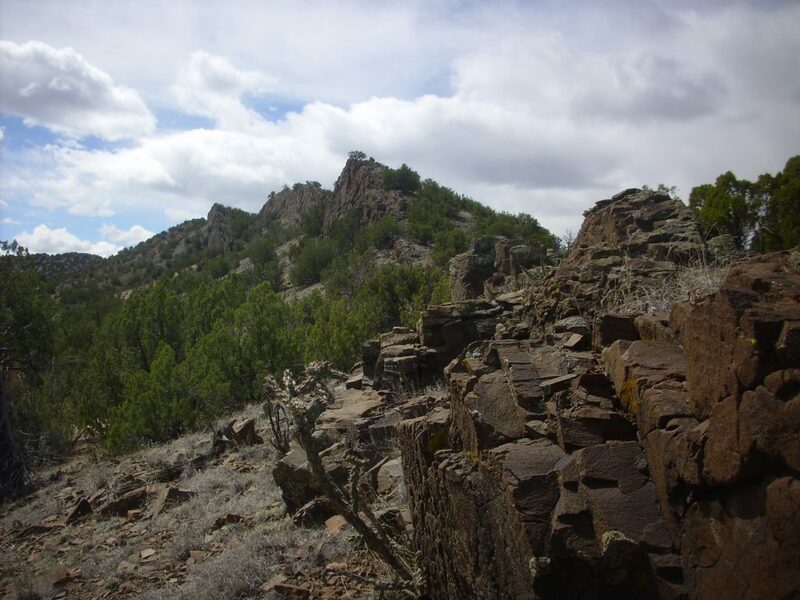 Tschicoma Peak is the highest point in the Jemez Mountains. This area really is quite flat. My thought was that this must be another river terrace level, but it’s mapped simply as Ojo Caliente Member on the geologic map. Further on, I came to what I thought might be an ash bed. 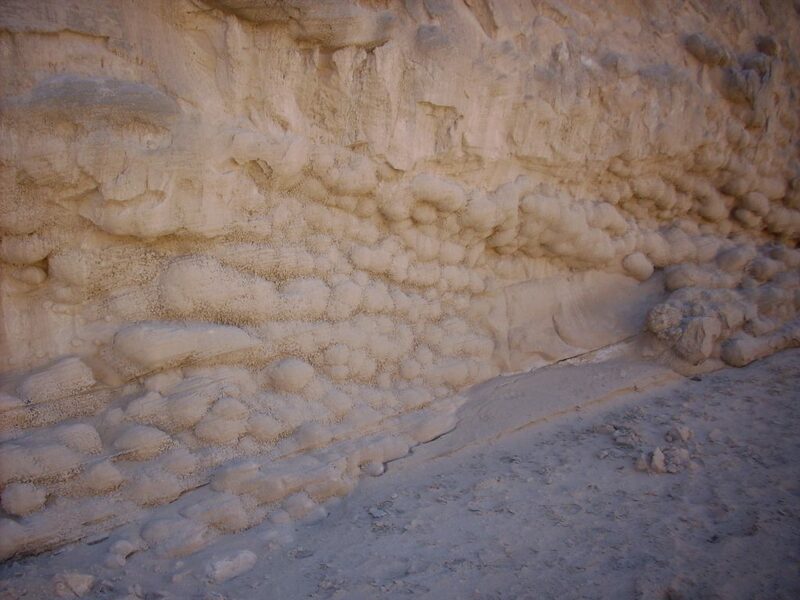 But on closer inspection, it looked like caliche, an accumulation of calcium in the soil common in arid climates. Later in my hike, I noticed this was most common in areas where there was a lot of weathered basalt. Basalt is relatively high in calcium. Sure enough, when I got home, the satellite view showed that the area just north of here is covered with basalt gravel. The trail approaches the ridge covered with basalt that I saw earlier. 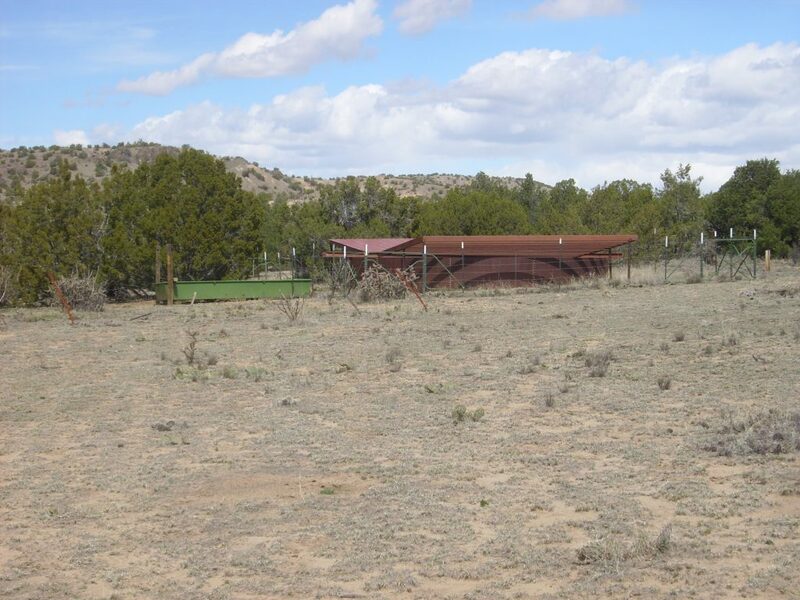 The foreground is Ojo Caliente Member rich in calcium weathered from the basalt. However, there may be an ash bed present here. 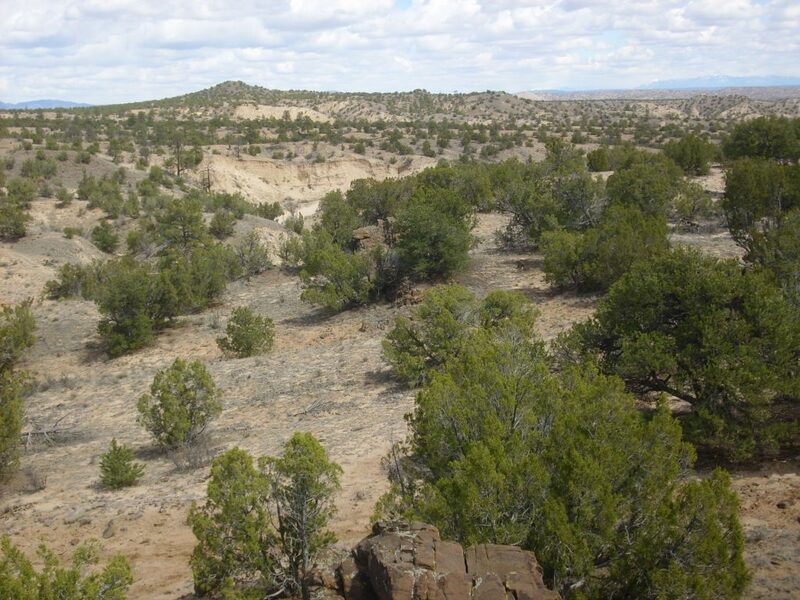 Ash beds are sometimes marked on geologic maps, but none is mapped here. And without getting closer, I can’t be sure it’s actually an ash bed. But it’s a interesting marker bed of some kind. I had estimated the hike from the map as three miles in, but, with the winding trail, it’s evidently more than that. But I’m most of the way there. The road ascends to the basalt gravel surface. This is probably the most strenuous part of the hike. Again, there are no solid basalt beds anywhere near here. This is a gravel of basalt cobbles. A fork in the trail, fortunately with signage. And, notwithstanding the signpost having an “ATV prohibited” icon, there are obvious ATV tire marks on the trail. Perhaps I’m too law-abiding. And now I come into view of my destination today: The Window Rock dike. The Window Rock dike is the easternmost of a parallel set of dikes running north-south through this area. These seem to be directed back at Clara Peak, they’re parallel to the fault blocks of Lobato Mesa, and the rock has the chemical composition and age of a Lobato Mesa basalt. So these are likely fissures that were filled with Lobato Mesa magma that did not quite break through to the surface here, though it’s possible that small volumes of lava erupted and formed the basalt that became the nearby gravel fields. If so, the small flows have since completely eroded away. The soft sediments around the dikes also eroded away to leave the dikes as long black natural walls. 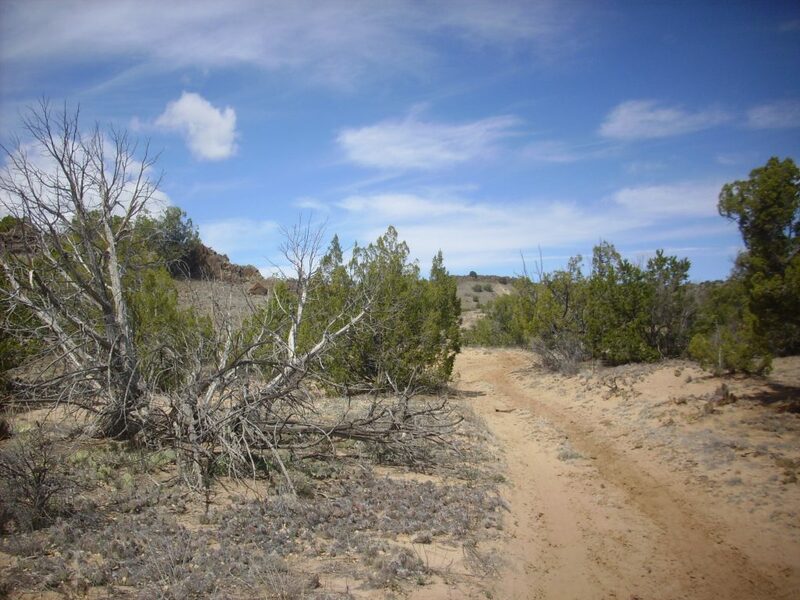 The trail descends into what is likely a dry lake bed, and we see why the dike gets its name. The area is inhabited, more or less. I don’t fear cattle, but I do respect them. Work at it hard enough, and you can upset them, and then they can get mean. Considering that I eat guys like these, I can’t entirely blame them. Though these all appeared to be cows and not steers. Four miles. And Watchful Cow is watchful. The lake is not quite dried up, thanks to an artificial berm. Nearby is Window Rock Trick Tank. I like the festive colors. A trick tank is a covered tank of water that has a basin with a float device to dispense water as it is drunk by cattle. Not my kind of raised bed garden. Actually the well supplying the trick tank. The trail heads to the north end of the dike. Beyond, the next dike comes into view. I reach the end of the dike and collect a sample. A very dark, rather coarsely crystalline basalt. This seems like a good place to eat my lunch. My lunch spot gives me a nice view to the west and the next dike. And a nice view south along this dike. I can see now that this isn’t quite the end of the dike; there’s some more to the north, though it seems to end before it reaches Arroyo del Torro to the north. I walk south along the dike, looking for any sign of hornfelsization along the dike. Hornfelsization is a metamorphic process in which sediments next to a dike recrystallize into a very tough rock called hornfels. I see none here, indicating either that the magma was not very hot or rich in volatiles or the sediments were not suitable for recrystallization. I back off and get a final panorama. The weather is deteriorating. Snow (!) is predicted for the next day (today, Sunday, my birthday — and, yes, it is snowing outside now.) I head back. One last panorama, from the trail overlooking the terrain to the south. Not really any striking new geology, but this may be my Ansel Adams moment for the day. Or perhaps not; the bright clouds are in too much contrast with the scenery. To the east, some hills capped by a sandstone layer. This is looking across the Rio Chama. 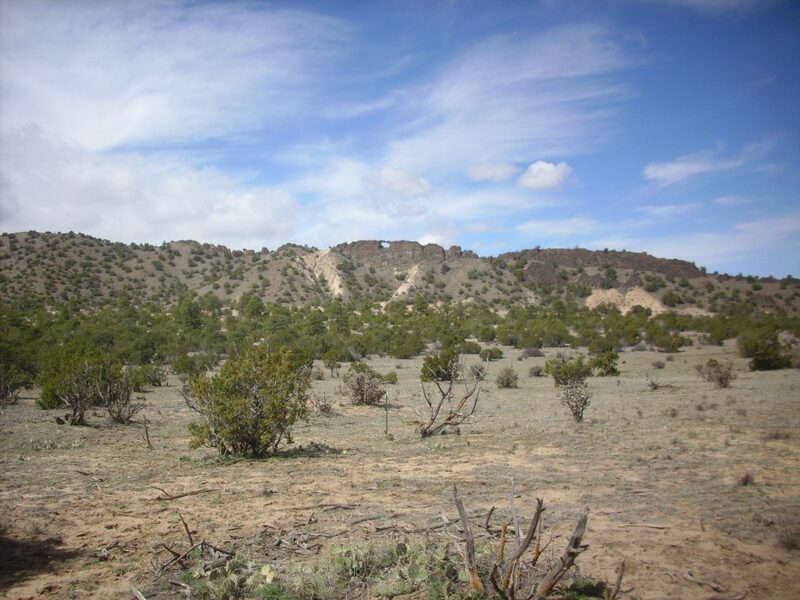 The skyline is Black Mesa, capped with Servietta Basalt over Chamita Formation, which, like Tesuque Formation, is Santa Fe Group rift fill sediments. The nearer hill just on the other side of the river is Chama-El Rito Member with a cap of unusually well-cemented Ojo Caliente Member. I am glad to be getting close to the end of the trail; my hiking boots are chafing just a little. I notice some flood control in a small arroyo that does not appearing to be holding up well. And two other cars. A hiker is getting ready to head out with his dog. I drive down to Pojoaque. It is not yet 3:00 and I want to get the oil changed and the car inspected before my big trip in two weeks. Also, my brakes don’t feel quite right; I may need new pads. The people at my favorite Jiffy-Lube take a look and tell me the front ones, at least, need immediate replacement. They don’t have a brake bay, but they call down to Santa Fe and get me set up to have it done there as soon as I arrive. The initial estimate is $450 to have both axles done. I am slightly horrified. On inspection, it turns out the rear pads still have some life; only the front need to be replaced now. $225 plus $50 for the oil change plus they find a nail in one tire whose repair adds another $20. I seem to have a bad habit of picking up nails in my tires, but I’m glad they caught it. I do not know what the issue is with nails. It is my birthday today. A new camera; that exhausts Birthday Claus’ budget and then some. I may get some presents of cash from other relatives, and, if so, that will pay for a charger and two spare batteries and some of the cost of the new camera. I’ll be glad to have those on the big trip.